1) Will I be able to figure out the shuttle system to get to my exchange point on time? 2) How will I balance all of this with breastfeeding? 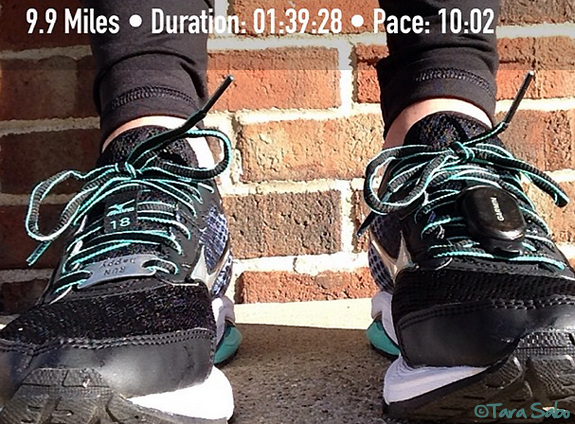 My feet were pretty comfortable, as was the pace of this run. I joined up with Sunset Coast Striders, which is a running group in my area. It was my first time with the group, and I wasn't sure what to expect. Turns out, it was truly good company. And they're all running Grand Rapids, too—the full marathon, not the relay. Back to race weekend: Seriously, I'm completely worried about the shuttle system. How the heck does that work? I'll have to pick someone's brain at the expo. And then there's the whole breastfeeding thing. If the race starts at 8, I'll have to pump about an hour before that. There will be milk readily available for my son, but it'll be another, oh...four hours after the gun before I can possibly meet up with the family. And, um, I'll be ready to explode by then. Do you see how my brain is swirling over this? I just keep telling myself that Evan will have food, and I'll just have to go with the flow (hopefully not literally). ANYWAYS. I'll figure it out. And, you know, laundry and everything else that needs to be done. Speaking of laundry—I have a fun little giveaway for you. The following portion of this post is sponsored by Fit Approach and WIN Detergent. I was given two free bottles of laundry detergent in exchange for my thoughts—which are, of course, my own. With all this running I'm doing, and...oh, there's the day job at the gym, too...I'm frequently producing a pile of fitness gear that needs to be washed. Because I'm neurotically picky about how my clothing gets washed, I let that pile grow until I don't have anything in my drawer left to wear. When it's time, I wash it all at once in cold water sans fabric softener on the Normal cycle. (Skip the dryer, of course.) And for the most part, it gets clean. But as you know, sometimes fitness gear just never feels clean. 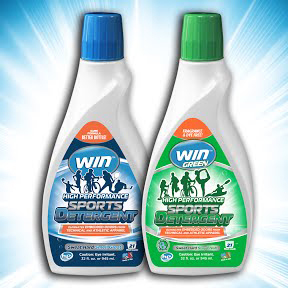 So when Fit Approach offered up the chance to sample two bottles of WIN Detergent, I bit. 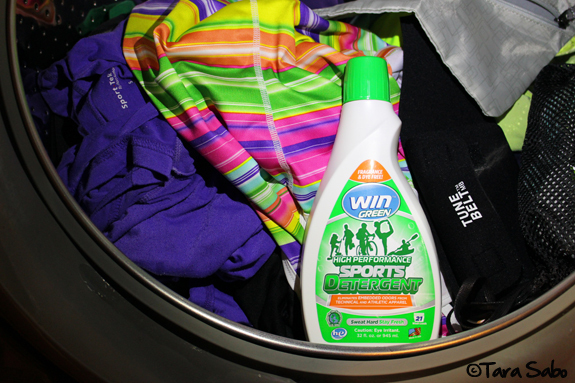 WIN Detergent is designed to clean sweat, oil and odors from the synthetic fabrics that are commonly used to make fitness gear. Regular detergents do this, too, but WIN is supposedly more efficient at breaking down all the bonds in the crap that makes your sports bra smell. WIN GREEN is, as you can imagine, dye- and fragrance-free. My honest opinion? My fitness gear definitely smells nice. In addition to all of my clothing, I've used it on my Vibrams, my Nike Studio Wraps and my tune belt (that holds my mic when I'm teaching), as well as my daughter's swimsuit. Clean factor? In check. Good. Do I suggest that you drop your favorite detergent in favor of WIN? I leave that up to you, your budget and the frequency at which you wash fitness gear. Personally, I find it easier to stick with just one bottle of laundry detergent. And honestly, my gear never really smells THAT bad, so regular detergent works for me. But if you've got kids in sports, or if you don't wash laundry as frequently as I do, then you might think differently. I've got two bottles for one lucky Daily Dose reader in the USA. Contest ends Friday, October 17, 2014 at Midnight, EST. Use the Rafflecopter widget below to enter. I have a new addiction...boot camp. 30 mins HIIT style workout. Love it! Nothing gets me sweaty faster then the stairmill and running. Good luck this weekend you'll do great.